Announcement PLEASE NOTE that our processing time is temporarily extended to 8 business days* as we allow our team to spend spring break with their families. To thank you for your patience this week, we are offering 10% off all orders, no minimum purchase necessary! This is the perfect time to shop for upcoming weddings, Mothers Day, and all other gifting needs you have this year! *we cannot provide refunds.cancellations due to a misunderstanding of our increased timeline. Business days do not include Sat/Sun. Thank you for understanding that this policy ensures that we remain a profitable small business that can continue to support our team and serve our lovely customers! 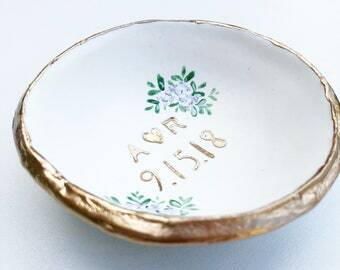 Thank you for visiting the shop that created the original personalized white and gold ring dish! I'm so glad you're here! What to expect: After you submit your order it goes straight to our production team. We will reach out to you if we have any questions about your order, so no news is GOOD news. Once your order is shipped, you should receive an email with the tracking information. Due to the volume of orders we ship each day, our packages are dropped off at a USPS loading dock, meaning we don't witness them being scanned in. Please note that tracking may take a while to update, however if it hasn't updated in a few days contact us so that we can resolve any issue. Also note that USPS is not a guaranteed service and we see the same tracking as you do, so if there is a delay in shipping please contact USPS directly. I wish we had more control over that but once we hand off the packages it's completely out of our hands. When you receive your order, if you love it, please consider leaving us a five star review. It means the world to our little shop, and we seriously do a happy dance every time one comes in. It's because of YOU that we get to do what we love every day. Thank you again, I am so overwhelmed by you amazing people who have supported our shop since 2014! PLEASE NOTE that our processing time is temporarily extended to 8 business days* as we allow our team to spend spring break with their families. To thank you for your patience this week, we are offering 10% off all orders, no minimum purchase necessary! 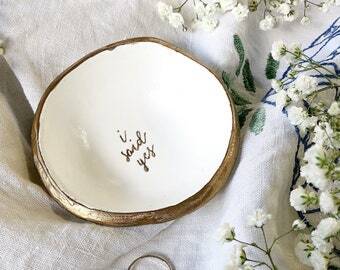 This is the perfect time to shop for upcoming weddings, Mothers Day, and all other gifting needs you have this year! *we cannot provide refunds.cancellations due to a misunderstanding of our increased timeline. Business days do not include Sat/Sun. Thank you for understanding that this policy ensures that we remain a profitable small business that can continue to support our team and serve our lovely customers! A new addition to our bridal line! Brand new design, inspired by our own experience with nature and the feeling of being “home” in the mountains. Peonies! A brand new beautiful add on ~ perfect for every occasion! 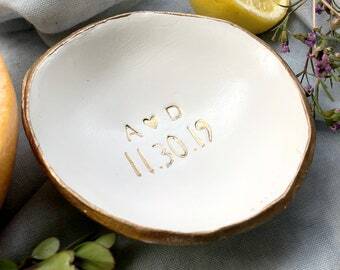 The perfect wedding day placeholder for your head table! We often stamp the logos of large companies as corporate gifts or client gifts. Annie is the mastermind behind all of the gorgeous watercolor designs! Thank you for supporting our team! We are beyond grateful for your support! In 2014, I (Natalie) went in search of something unique. I was inspired by all things with a white + gold combination, and I wanted to be able to personalize it. After weeks of research with no luck, I set out to create the product I had in mind. 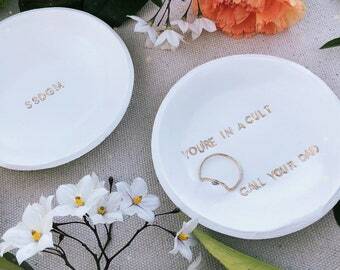 The ring dishes I came up with were entirely unique, and the response was overwhelming. Gift-giving is a dying art. In a world where automated manufacturing is taking over, finding something unique at an affordable price is nearly impossible. I created The Painted Press to ensure that gifts could still be personal, intentional, and affordable. Through the years working on this business, we have had many incredible opportunities. From being featured in many major publications, to celebrity events, to every single meaningful conversation with a customer, this business has been the biggest blessing. It has allowed me to work closely with my family, who have all played a major role in keeping the operation going, and it has provided the opportunity to meet and talk to hundreds of people I never would have had the blessing of knowing otherwise. It is because of all our customers and their support that I have the ability to stay up late painting and call it my job. It is because of you that this dream I didn’t even dare to dream out loud has become my reality. It is because of you that I get to employ college students in need of work. It is because of you that we have food to put on our table each night. And in return, we seek to shop small and support other Etsy shops. So seriously, you make all the difference. Thank you. 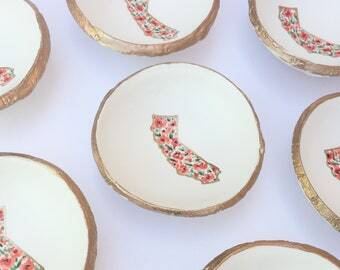 Natalie started an Etsy shop when she was just 18 with a ten dollar bill and a vision. 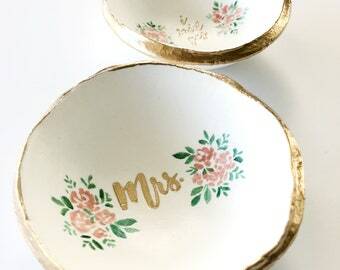 Four years later and her business, The Painted Press, has gained national media attention, supports her and her family, and sits in the top 1% of all Etsy shops! Annie is the wonder woman behind all of the watercolor and freehand designs from florals, to calligraphy, to custom landscapes. 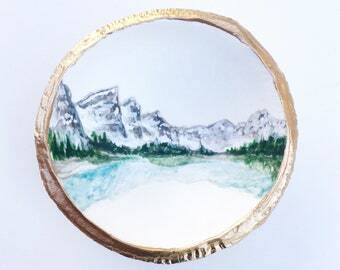 She is able to turn almost any request into a stunning jewelry dish. Josh quit his job in 2015 to join The Painted Press and has been full-time every since. He's the man who processes our orders, makes sure we pay our taxes, and answers Etsy messages and emails. Emily has been with The Painted Press since it's earliest days, and is an expert in creating our designs. From sanding, to painting, to order matching, she's the one who makes sure our production runs smoothly. Elena came on board, tore us down, and built us back up with processes that have greatly improved our efficiency. She is the lead shipper and makes sure your items are packed with love and care, and shipped off to you as quickly as possible! Evie came on more recently as we expanded, and with an eye for design she has become an invaluable asset to our team! She assists with production and customer service. The Painted Press ("us", "we", or "our") operates the www.thepaintedpress.etsy.com website (the "Service"). Shoot us an email contact@thepaintedpress.com and we will set you up as a wholesaler! We would LOVE to be carried in your store! What are these made out of? Are they fragile? 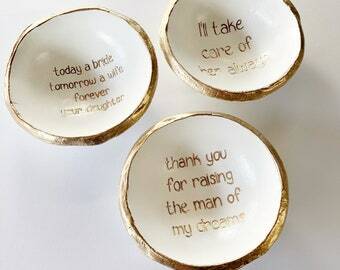 I create my dishes out of air dry clay for multiple reasons! 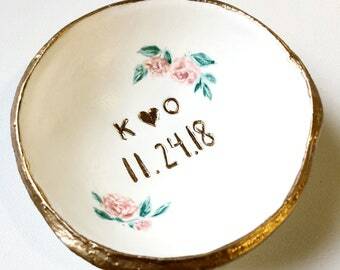 We are able to paint watercolor onto them unlike ceramic dishes, giving our shop a very distinct and unique style. I am also able to create them at an affordable price. It is my goal to make gift giving easy, personal and affordable. Because loving your friends and family shouldn't have to break the bank! LASTLY, they are SO durable! If it falls off the counter, no worries. We actually drop them in front of people at craft shows to showcase durability!